BOOK REVIEW: Laina Farhat-Holzman, Reviewer. Because historic memories in the United States tend to be short, there has been a resurgence of romanticism about Marx and Lenin by those who believe that Stalin’s Communism perverted what was intended to be a benign philosophy of creating a just world. Many people on the far left of the political spectrum hold this view, but so do all utopian and dystopian tyrants in the world, who secretly like Stalin better than Marx and Lenin. My colleague James DeMeo, a geography Ph.D. (a rare degree today), has just come out with what he calls “The other ‘Little Red Book'” (borrowing from Mao), in which he has compiled the words of Communism’s founding fathers, words in private correspondences or obscure speeches, that reveal what these people really thought. This is a little book, available on Amazon, but deserves much more attention than it will likely get. I read it in one sitting because it is no larger than a decent essay might be, but its effect is explosive. I have never been naïve about Marxism, but I had no idea that it was the godfather of all fascism and has also been a model for today’s Islamism as well. We were foolish to think that religion and communism were inherently enemies; this book shows that they were not. It is widely believed that Stalin and Mao were butchers, but Marxist apologists still insist that their horrors were a perversion of Marxism. This sounds exactly like the apologists for Militant Islam, who claim that their horrors are a perversion of real Islam. Both of these groups of apologists appear ignorant of what their glorious founders actually believed and said. They advocated “exterminating” the peasants of the Ukraine by starving them to death (which Stalin did); they also set up concentration camps and advocated and executed mass deportations of entire peoples (such as the Chechens and Tatars) to Siberia. One example of Lenin’s instructions particularly shocked me: “Comrades! The kulak uprising in your five districts must be crushed without pityYou must make example of these people. 1) Hang (I mean hang publicly, so that people see) at least 100 kulaks, rich bastards, and known bloodsuckers. 2) Publish their names. 3) Seize all their grain. 4) Take hostages per my instructionsDo all this so that for miles around people see it all, understand it, tremble, and tell themselves that we are killing the bloodthirsty kulaks. Telegraph your receipt and implementation.” The kulaks were only prosperous farmers who resisted collectivization. Another shock: “slaughter of those wounded fighting against youanyone raising the sword against the existing order will perish by the sword.” Mohammad did the same in his wars against unbelievers. The cumulative horror of reading these century-old quotes are indeed shocking-and yet terribly current, as practiced by today’s monsters. The little book also provides a brief timeline of early communism. Very good reading. 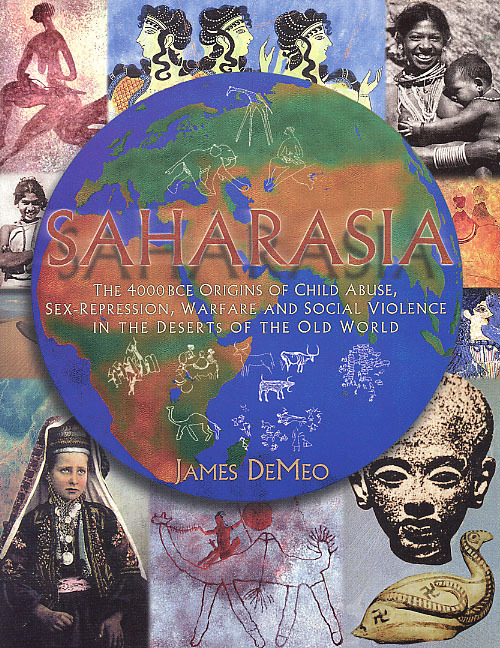 DeMeo has done us all a service in this revisit to a history that we had all better know. It is alive again. Dr. Laina Farhat-Holzman is a historian, lecturer, and author of God’s Law or Man’s Law. My prior posting on the Southwestern drought and low levels in Lake Mead led to some interesting correspondence. Here is my reply to one of them, redacted a bit. There are of course plenty of independent reports verifying Reich’s work with the cloudbuster. My reports happen to be the most systematically-constructed field experiments from a scientific-proof standpoint, with large-network data-analyses, often undertaken within a peer-review context and at the invitation by government agencies. I am university trained in the atmospheric sciences and worked for a decade as professor in several top universities, Departments of Geography teaching Earth and Atmospheric Science, Climatology, etc. 2. There is a hard-cover reprint of my original 1979 systematic study of Reich’s cloudbuster at the University of Kansas, subjected to peer-review by the other professors in my home department. It is an older document, but summarizes many basic issues. 4. Finally, here are some historical details on the major overseas field expeditions, and the many people who cooperatively assisted in those efforts. Most of my associates or co-workers on this subject are today either in retirement or dead and gone. Many were PhDs or MDs, very skilled professional people often with university appointments, or they were officials in Agricultural Ministeries or Civil Aviation departments of foreign governments. Others were unaffiliated people with lesser pedigrees but a lot of knowledge and big hearts, who found great truth in Reich’s discoveries, and applied them in their life, and private enterprises. In Eritrea I lead a team that ended a 30 year drought cycle with rains that began within a few days after we began working. Overall a 5-year project was developed and funded by that nation, at bare-bones expenses, and they had five years of excellent rains. These rains were subjected to analysis by official Eritrean rainfall data, and documented as developing after the periods of our field operations. The rains spread over much of Ethiopia and Sudan, and other parts of the Sahel, such that the overall runoff through the Nile River basin filled Lake Nasser behind the Aswan Dam for the first time in its history, dating back to 1968. Massive new overflow lakes were also created out in the open Sahara, due to the "excess water" flowing into the Nile and Lake Nasser, something never before happening. Eritrea collapsed into Stalinism and a bloody war with Ethiopia after 1999, forcing an end to that project. The young Eritreans I hoped to train, to take over this work all vanished into the Eritrean military, for front-line actions. I was later informed by friends that the cloudbuster equipment we left behind was rusting away, abandoned in a weed-patch. Drought returned by c.2002 and has more or less persisted since. The overflow lakes, so large one could not see the shoreline on the other side and visible on Google Earth and satellite images, have since begun to dry out. The older democratically-inclined government officials who supported my work could no longer be found, they either fled the country or went into prisons, retired in silence or died. I cannot know. The Namibia project was organized by the German GDZ development agency, through friends in Germany. They developed contacts in Namibia whom I cannot recall at the moment. My teams’ work triggered excellent rains across the entire southern part of Africa, ending what was a 12-year drought in Namibia. Anyhow, that project was strongly opposed by Namibia’s top meteorologist, a deeply Christian Afrikaner Boer, who in spite of the excellent rains that followed our work and ended the drought, at the end of our project screamed at me "Only Gott Kan mayke it drain! Gett de Hell out ov mein Office!" Totally crazy. 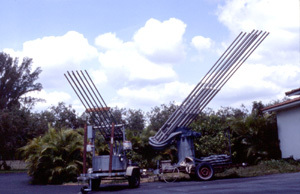 The one local fellow who took an exceptional interest in this work, and whom I trained and entrusted the cloudbuster to and kept in contact with — a farmer-rancher of German descent who already knew Reich’s work in some detail — later fled the country with his family, when Mugabe-ism was stimulating murders of white farmers and their families. The Israel operations ended a 3-year drought with rains of an historical magnitude, which spread across the entire Eastern Mediterranean. It ended their drought, filled their main reservoir Lake Kinneret (Sea of Galilee) but was opposed by the head of their hydrology section who also ran a very ambitious cloud-seeding program. He was boiling with anger against our project, which he felt was a threat to his cloudseeding efforts, even though there were no clouds to seed before our work was undertaken. He also was a former engineer for a housing project built down in an old paved-over dry lake bed… which predictably filled with about two meters of water given all the good rains. He was smart enough to dedicate the lower floor of that apartment complex for automobile parking, but didn’t plan well enough for drainage. The Israeli meteorologists later fabricated an "explanation" that the good rains were due to the eruption of Mt. Pinatubo on the other side of the planet six months earlier, and not due to our cloudbusting. Later investigation by unrelated climatologists, in a published a paper documented a global decline in precipitation following Mt. Pinatubo, making Israel one of the very few places on the planet with exceptional rains in the post-Pinatubo period. Or the post-cloudbusting period, I should say. Why hasn’t it yet been accepted in the English-speaking world? A comparison of the opposition to the Wright’s airplane or Goddard’s rocket is informing. Saul rarely becomes Paul, and as Max Planck once famously said, "Science progresses, funeral by funeral". We might say, not enough of the old guard who banned and burned Reich’s books, or their intellectual offspring, have died. But Reich’s supporters are not immortal either. I cannot tell you how many times I was slandered by mainstream journalists and a few scientific big-wigs within the USA and UK, often with my rebuttals refused publication. Or I had to threaten larger public exposure of their unethical lying and censorship to get even a small rejoinder published. There are other published materials, but these are easily available via internet. I’m not sure how much more one could ask for in the way of obtaining support from the US government, or affected agricultural or industrial concerns, to fund a project aimed at drought-abatement and refilling Lake Mead. If the skepticism is so thick and intractable that they won’t even return a phone call, or respond to a serious proposal of a workable solution, in the midst of a severe water crisis, then there is nothing more I could do. We simply do not have the financial resources to launch similar field-work expeditions into the American drought regions. An article recently appeared on ABC News, that one of America’s primary agricultural water reservoirs, Lake Mead, has declined to record low levels. The dramatic turn-around in those cases, the major success in restoring widespread rains and ending droughts, is a matter of published record, with far more documentation than Reich was able to assemble, given the modern data and satellite images available today. But for the current drought, our private fund-raising efforts elicited only around $5000 pledged, and around $1000 actually donated to my non-profit research foundation, OBRL (Orgone Biophysical Research Lab), by the end of 2015. Not even enough to cover the repair costs already spent, much less to mount a major field-work expedition into Southern California and Arizona. The pledged funds were never accepted, as it could not begin to cover the expenses. Such are the real-world consequences of the chronic slandering of Reich by the "skeptics" and "Wikipedia", and the distorters pushing "orgonite" and "chembusters", all of whom deliberately try to make Reich and the whole subject look ridiculous. And I should also say, not a small amount of slander has been hurled in my direction by the same "skeptics" and other malicious buffoons, not a few of which who like to call themselves "Reichians". Such diverse negative reactions to Reich’s findings have the common themes of running away, or emotional plague attacking through slander and distortions. The discovery of a universe filled with pulsating life-energy, which participates in the formation of clouds and rains, and works also inside the human to govern emotions, perception and biology, is generally "too much" for the average person. Other factors were involved, however. The water resource agencies and the billionaire farming industry all bet upon El Niño to save them with massive rains. But El Niño didn’t deliver the rains in sufficient quantity. Also, there is too much money to be made with drought. The price for an acre-foot of irrigation water increases dramatically during droughts, making irrigation districts happy. Drought-related funding agencies see their budgets triple or quadruple, and Billions of taxpayer money are devoted to drought issues that would never have been given out otherwise. The "drought experts" become important people, everyone wants to interview them, and they are promoted to higher-paying jobs with inflated budgets. Massive new irrigation and pipeline schemes, and desalinization plants which deliver either small amounts of extra water, or water at very high prices, and which never would be funded without a really severe drought, suddenly are reviewed as "serious proposals". Governments and investors line up to pour Billions into the pockets of the "drought engineers". Then the big farmers collect massive insurance money, often nearly equal to the profits for a good crop harvest, so they are inclined to sit back and relax. All that is stimulated by drought, but is threatened by good natural rains, as could be brought and sustained by authentic cloudbusting work. Meanwhile, the costs for a cloudbusting project as necessary to restore Lake Mead to its normal levels is about that needed for one large agricultural tractor. A pittance for such high-rollers and government agencies, but a small fortune for working-class people, myself included. Current OBRL funds are not sufficient either. But all those usual "drought activities" fall within the currently-accepted methods of mechanistic science, industry and economics. Everyone is accustomed to them. Media writers also "know" those approaches and write favorably about them. Something so truly new and revolutionary as Reich’s discoveries – the orgone energy and cloudbuster – simply stuns them, they can’t believe it, and so the first impulse is to put it down, ridicule it, slander it. It is not reported on their favored media, or is slandered by that media as on "Wikipedia", so they don’t even get to the point of reviewing the evidence. It is all "too fantastic", no matter what the evidence. 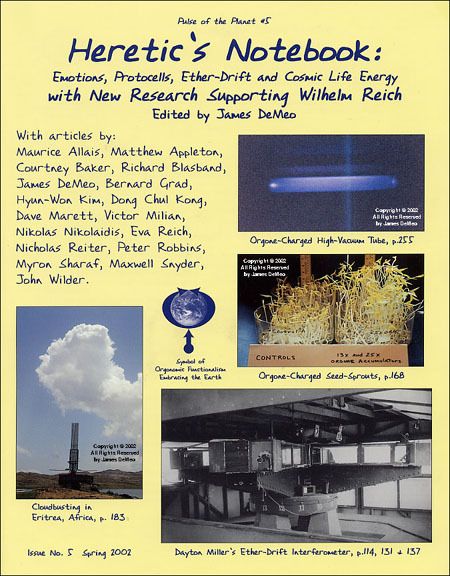 My work through OBRL has some of the very best scientific evidence in numerous studies supporting Reich, and on the cloudbuster as well, documented with new data and satellite documentation methods not available in Reich’s time. No matter, no amount of evidence will overcome the will to disbelieve, the urge towards ridicule and sarcasm, the running away, and so forth. Reich wrote about this problem extensively, in discussions on the Emotional Plague of Mankind. Based upon what I know from more than 40 years of active research in orgone biophysics and the empirical aspects of classical atmospheric science, it is technically easy to end a severe drought, if one has the knowledge and experience. But it is nonetheless extremely laborious and taxing, and also a serious life-or-death enterprise, with heavy responsibilities. We have the right equipment, the best people, the accurate knowledge, and have made atmospheric breakthroughs many times already. But navigating the social desert, the emotional desert, this is a true wilderness for which no device like the cloudbuster can make any breakthrough. The social desert was created by the emotional plague, and is dominated by it. One has to proceed carefully, like walking in a swamp with crocodiles, who worm their way into vital social organizations and institutions. What is needed is personal contacts with high-up officials who can open doors to funding and logistics, or alternatively, contacts with people of wealth, who can cut a sizeable donation check to our non-profit, to get things moving. We can then figure out our own logistics. And truth be told, this new finding is nothing so new, actually, as it was the geographer Elsworth Huntington who firstly identified these major climate shifts in Mesoamerica, in the mid-20th Century. Citations given in my work. This also helps understand the emphasis of the heart-choppers on rain-making "magic". Didn’t work, no matter how many hearts were chopped out, Nature scorned them and the good rains didn’t return. Hundreds of smaller cultures across Mesoamerica were decimated, and didn’t take kindly to being constantly raided, kidnapped and hauled back to the tops of pyramids to be butchered, some skinned alive also, all commanded by those wunderful Mesoamericans. Mel Gibson’s movie Apocalypto gave a fairly accurate portrayal of the great cultural differences, between the violent heavily armored heart-choppers and their more peaceful relaxed victims, but the PC brigades in the academy went nuts over it, claimed the ancient pyramid-builders were "peaceful" (not so, they were severely emotional plague), just as the same academy today says about Muslim culture. The peace of the grave, in both cases. For clarification on how the Mesoamericans came to be so heavily armored and violent prior to the arrival of Columbus and the Europeans, it is covered in my book. A tip of the hat to Donald Bill for alerting me to this item. from James DeMeo’s 3-year study on the subject. http://www.orgonelab.org/Articles/HealingClayAcresUSALetter.pdf Some of the publications I cite below have similar, even better and more amazing photographs of orgone-enhanced seed-sprouting experimental differences. Control versus Orgone-Charged Seeds (see below for reference). The article by Silverthorne and the letter brought back personal memories, from the time when I was a teaching classes on Renewable Energy and Human Survival Geography at the University of Kansas, and later at Illinois State University. I always had a section on organic farming and beneficial insects in those classes. These were agricultural regions with a high percentage of students from farm families. I could also note, having grown up among farm animals and agricultural fields, these students were far more contactful, alert and alive by comparison to the generally dulled citified students I later encountered from wealthy families, attending classes at an expensive private university I once taught at, and which prided itself mostly for the student party-life than serious study of science and the world. I subscribed to Acres, USA to reinforce my knowledge of ecological agriculture and beneficial insects, and encouraged the students to do likewise. I later got to meet Charles Walters, the founder of Acres which has been published for over 40 years now, and was graciously invited by him to speak several times on my orgone energy research at their conferences in nearby Kansas City. They were warm and welcoming to my experimental work confirming Reich’s discoveries. For myself, I had been building orgone accumulators and testing them out in various ways since the early 1970s. By 1990 I had also written the Orgone Accumulator Handbook, which today is into its third edition, still selling well among people of all different backgrounds. 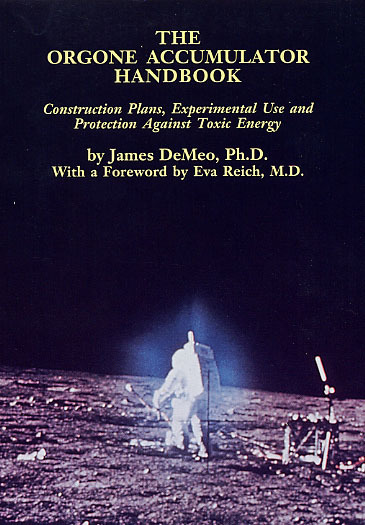 Orgone energy is real, and the effects can be documented in various ways, as I detail in the Handbook. 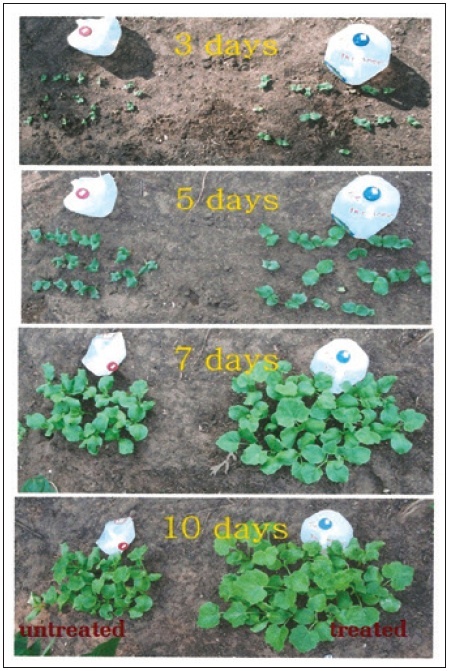 A photograph of one of the experimental results is given at the top of this article. Another version of this article appeared in our publication Pulse of the Planet #4: Heretic’s Notebook, along with more than a dozen other interesing articles on similar subjects. I also at the time came into contact with farmers applying ancient handed-down lore and ecological methods that suggest life-energy functions. For example, there are powerful lunar cycle effects upon all life, including plant growth and seed-sprouting factors. Frank Brown, the biologist at Northwestern University, years ago proved in excellent experiments how full and new moon periods exerted powerful influences upon seedling growth, yielding increased sprouting, and validating the ideas of ancient farmer’s lore. Likewise the old art of the "claysingers" has validity, stirring water in large barrels and mixing in various clays, manures, and other things, making Viktor Schauberger-type of "living water" vortexes into which they could speak or sing to yield fascinating harmonic resonance tones, and then spreading that liquid onto their fields under specific lunar cycle conditions. Such ideas go back to old Europe, but may also have aspects from Native American lore incorporated. The bionous formulations as per Silverthorne’s article, such as the use of clays or herbs for healing poultices, were well known on both sides of the Atlantic, well before the coming of the MD or hospitals, as healing or energy-charging preparations. Likewise the rich tradition of herbal preparations and “healing waters” in thermal hot springs. Those methods along with the human health benefits of the orgone energy accumulator, as well as with the orgone-charging of seeds for agriculture. They can enhance and boost plant growth, flowering and fruiting, whether one coordinates with the lunar cycles or not. But in my opinion, it is always better to do such things with the natural cycles. My Orgone Accumulator Handbook also goes into these issues in some detail. Reich’s name and work has survived all of this nonsense, at least among intelligent people, thankfully. But even modern physics is troubled by the same, with hawkers appropriating the terms "quantum" or "tachyon" with equal absurdity. Aside from the fraud and ridiculous nature of it, it has a harmful effect in how "orgonite" and the claims of its advocates, are today used by the awful "skeptic club" people and on equally terrible Wikipedia, to define Reich’s work. Another total lie, but that’s how it goes. 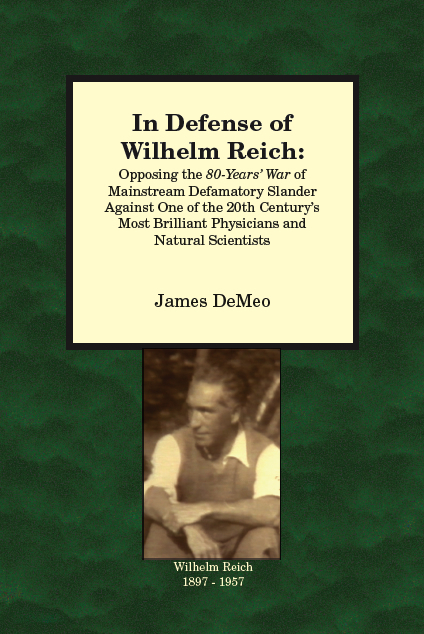 Wikipedia is the worst-possible source of information about Reich and his discoveries, mostly given how they routinely censor from discussion any mention of the various scientific research experiments that have been undertaken by university-trained PhDs. Even citations to peer-reviewed scientific papers verifying Reich are chronically deleted from Wikipedia pages. More info here! Note that I do not sell orgone energy accumulators, but I can recommend the Orgonics company on the West Coast, which makes the very best ones. Ask about their special garden seed charger, in which flats can be put for boosting. In all cases, whether you buy or build your own accumulators, I still recommend the Orgone Accumulator Handbook, for guidance on just what the orgone energy is, and how to optimally use the accumulator. For example, it must be protected from microwaves and other toxic radiant influences such as computers, cell phones, electric power-line fields, fluorescent lights, and similar. And beware, most of the “information” about orgone energy on internet is pure bunk, with few exceptions. Our thanks to Mr. Silverthorne, Ms. Espanca, and all the others who have kept the life-affirming and beneficial aspects of Reich’s authentic orgone energy discovery alive and thriving. Now available from Amazon and other on-line bookstores. (Weblinks below) Or from your favorite streetside bookstore, by special order. 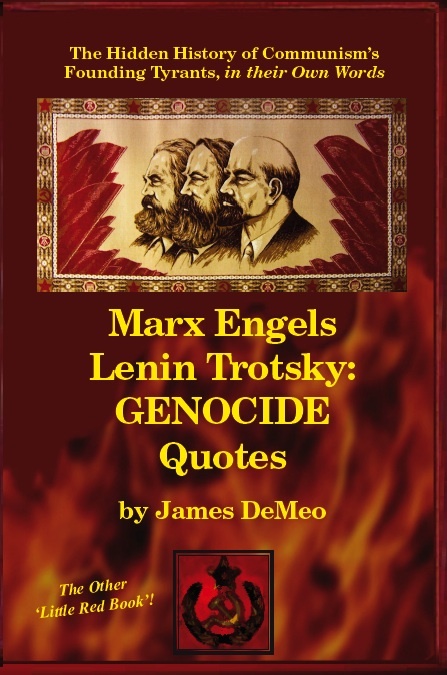 MARX ENGELS LENIN TROTSKY: GENOCIDE QUOTES. The Hidden History of Communism’s Founding Tyrants, in their Own Words. Perfectbound, 67 pages, color covers, with full citations and references. Illustrated. So say the Marxists. But a dispassionate examination of the writings of Communism’s founding tyrants, things they wrote in lesser-known books, articles, letters, documents, briefs and telegrams, indicates this benign view simply isn’t true. Comrades Marx & Engels advocated war, slavery, racism, ethnic hatreds & genocide. They mocked justice, freedom, democracy & equality, and had only contempt for the poor, workers, farmers & moderates. Comrades Lenin & Trotsky put Marx & Engels into practice, instituting a reign of terror, assassinations, slavery, mass-murder & genocide. They promised democracy but usurped it & imprisoned or murdered dissenters, opponents & "counter-revolutionaries." They seized food from starving farmers, executed surrendered & wounded soldiers, along with random prostitutes, alcoholics, factory workers, tradesmen, peasants, villagers & ethnic groups, with massive deportations of men, women and children to the Siberian Gulag – a prison system begun by Lenin, not Stalin. In this exacting review by historical scientist James DeMeo, PhD, the Hidden History of Communism’s Founding Tyrants is exposed, in their Own Words. 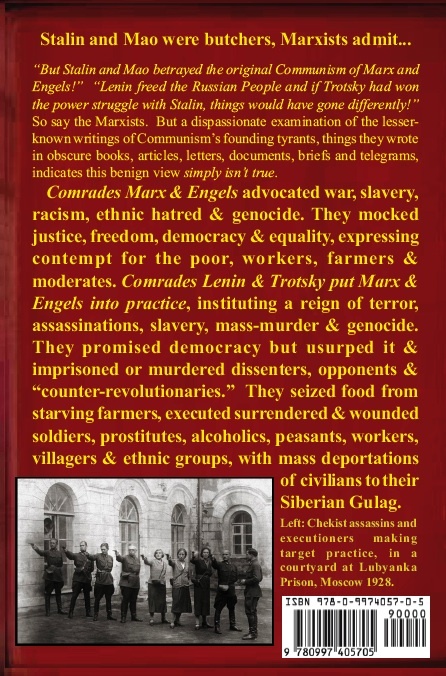 Marx Engels Lenin Trotsky: Genocide Quotes is a must-read book for every thoughtful student and adult, about the false "peace-justice" agendas of the Marxist movements which once again threaten the world’s democracies. FREE SHIPPING INTERNATIONALLY: You can now get the book in the USA and Internationally via the following websites, and also get free shipping. Amazon requires a minimum purchase to get free shipping, but Book Depository does not.